Do you have joint pain, swelling or stiffness in your fingers, wrists, knees, feet, ankles, or shoulders? Younger people are often surprised to find they have the early signs of arthritis. But people of any age can get arthritis -- even children. Arthritis literally means inflammation of the joints. Here, people share their experience with health ailments that have symptoms similar to arthritis, plus how to treat arthritis. While I don’t think that CBD oil is the magical cure for everything that goes wrong in the body, I do believe that the properties of CBD are quite beneficial for some conditions. Here’s what I’ve learned about CBD vs. THC and my personal experience using CBD oil for pain management. Acupuncture benefits those of us who prefer a holistic approach to medical issues. We live in an over-medicated society and sometimes alternative approaches (like an acupuncture treatment or two) are a better option than prescriptions. Here are the advantages and disadvantages of acupuncture therapy. Does your dog or cat have aches and pains? See how acupuncture can help your pets, too! When did buying an over the counter pain reliever become such a difficult choice? Things like type of pain, duration of usage, age, and more are the considerations you should be making when choosing the right pain relievers for your family. 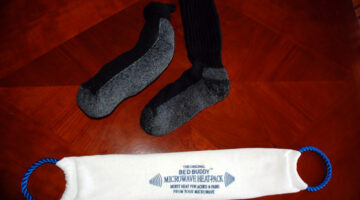 It’s as easy as 1, 2, 3 to make a heating pad yourself. A microwavable heating pad is great to use whenever you need to apply some indirect heat for pain relief, comfort, or warmth. Follow these step-by-step directions to make your own heating pads and don’t throw away the stray sock that shows up after you’ve thrown it’s pair out! Do Topical Pain Relief Creams & Gels Really Work? Topical pain relief creams and gels CAN alleviate some of your pain when applied directly to the skin right over the pulled muscle or sore joint. Here’s what you need to know about the 3 types of topical pain relief cream like analgesics or aspirin-like rubs, counter-irritants, and creams made from chili pepper seeds. Following is a list of common ailments and the foods that can prevent them, if not cure them completely. I’ve been living with Lyme Disease in Tennessee for years now. Here’s my story — how I got Lyme Disease from a tick bite and the Lyme Disease rash that followed. Plus, a little about the Lyme Disease movie that had a huge impact on me, a list of people in Nashville Tennessee with Lyme Disease, and a little about Lyme Disease doctors in Nashville Tennessee. Got Neck Pain? Helpful Online Videos Of Yoga And Physical Therapy Neck Stretches That Work! I’ve found a number of neck stretches that really work for me to alleviate the tense pressure in my neck that builds up after spending time at the computer. This neck pain that usually lingers into the night. The following neck stretches are some of the same ones that the chiropractor and physical therapist recommended to me. They really work! If you are a looking for neck pain treatment, then you’ll be thrilled to learn that help is right at your fingertips, and it takes less than 5 minutes to do these neck stretches… that REALLY work! Seriously, I suffered from chronic neck pain and it’s possible to find neck pain relief without spending a ton of money. The well-respected consumer product authority, Consumer Reports, has started reviewing medications as well. Their free Web site compares medications in terms of price, effectiveness, and safety.